The Pearl Harbor Day Memorial Service will take place on Sunday, December 7th, at noon at the Flag located at the VFW Post #9249, 2121 Grand Island Blvd. The public is invited to participate in the memory of those who perished at Pearl Harbor and the Pacific Islands. "Remember Pearl Harbor". The Grand Island VFW post 9249 is hosting a children's Halloween party on October 25, 2014 from 2:00 to 4:00pm. Families are welcome to attend this free event at 2121 Grand Island Blvd. Children will have fun with games, candy, a costume contest, a bounce house, face painting, and pumpkin carving! Snacks will be provided, soda cans and bottled water will be available for purchase. See flyer for details. Hope to see you there! (October 13, 2014) When you get a haircut at one of the more than 1,200 Sport Clips across the country, you can "help a hero" at the same time by donating to the company's Help A Hero program now through November 11, Veterans Day. Over the next four weeks, Sport Clips' locations nationwide will have a collective goal of raising $600,000 for the company's annual fundraising program that provides scholarship money to veterans. Since 2007, the company has partnered with the Veterans of Foreign Wars (VFW) to support service members, and last year, created the "Sport Clips Help A Hero Scholarship" program to help service members and veterans in the next chapter of their lives. Each scholarship provides up to $5,000 of assistance to service members and veterans who are pursuing an education at post-secondary institutions, including trade schools. Donations to Help A Hero will be collected in-store and at local fundraising events through November 11. In addition, Sport Clips will hold "The Biggest Haircut Day of the Year" on Veterans Day, when each store will donate a dollar from every haircut service to the VFW-administered scholarship program. "Sport Clips team members, partners and our clients have already made a positive difference in the lives of more than 130 veterans by helping fund their education through Help A Hero scholarships. We're hoping to award even more scholarships in the year ahead, and anyone can help - it's as easy as getting a haircut," says Sport Clips Founder and CEO Gordon Logan, a U.S. Air Force veteran and lifetime member of the VFW. "Thousands of U.S. service members returning home from the front lines still face an unstable economy," says VFW Commander-in-Chief John Stroud, a graduate of Embry-Riddle Aeronautical University. "Together with Sport Clips, the VFW remains committed to providing our service members and veterans with the tools they need to reach their educational goals and successfully transition back into civilian life. The Help A Hero Scholarship has proven to be vital to those efforts." Veteran recipient James Robak says of his Sport Clips Help A Hero Scholarship, "It will help out immensely since my GI Bill has been exhausted, and I still have a year left in my dietetics program. As a father of four, with ages spanning 14, 8, 7 and nearly 2; a wife that works full-time; and me being a full-time student; this couldn't have been a bigger blessing. It will really help take the edge off of the financial burden that a higher education carries, along with the benefits for a brighter future." Sport Clips is the official haircutter of the VFW, and its Help A Hero campaign is just one of the many ways it supports active-duty military and veterans. To find out more, visit your local Sport Clips at Sport Clips Clarence, 5095 Transit Rd., Suite 200, Clarence, NY 14221. 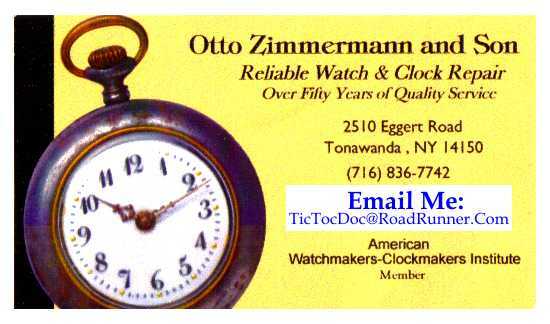 Phone: 716-565-9988, website. 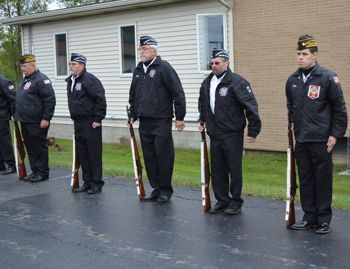 A ceremony to honor lives lost on September 11th, 2001 was held September 11th, 2014 at the Grand Island VFW. The American Legion and VFW Charles N DeGlopper Memorial Post #9249 hosted the event. 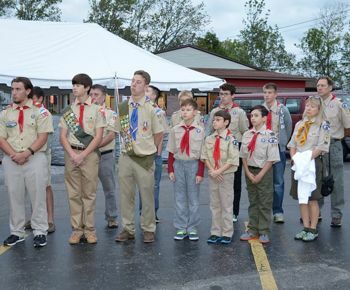 Participating organizations included the Grand Island Fire Company, Boy Scout Troop 510 and 630 and Grand Island High School, along with residents and officials. Candles were lit to honor those who lost their lives. 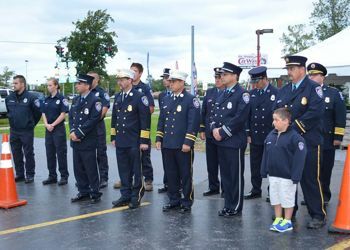 A ceremony to honor lives lost on September 11th, 2001 will be held September 11th, 2014 at 7:00 p.m. at the Grand Island VFW. The American Legion and VFW Charles N DeGlopper Memorial Post #9249 invite all who wish to attend. 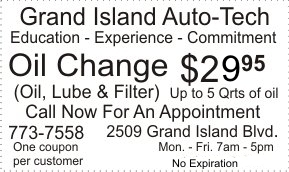 The address is 2121 Grand Island Blvd, Grand Island NY 14072. Charles N DeGlopper Memorial Grand Island VFW Post 9249 is hosting its annual 4th of July Open House after the parade until 6:00 p.m. Everyone is invited for great music, great food and a great time! Children's games and family fun for all ages. New to this years event is the Grand Island VFW Food Truck Rodeo. It will feature a diverse selection of cuisine from local vendors such as Knight Slider, Greek on the Street, R&R BBQ, Amy's Truck, Pizza Amore, Thai Me Up and FallyMac and Cheese. Come enjoy your hometown VFW open house. Happy Independence Day! From left: Youth Chair Molly McMahon, Ladies Auxialiary President Kathleen Blake, Scott Kalman, Scholarship awardee Kristy Kalman, Dahlberg family members Olga DeMicke and Adam Dahlberg. 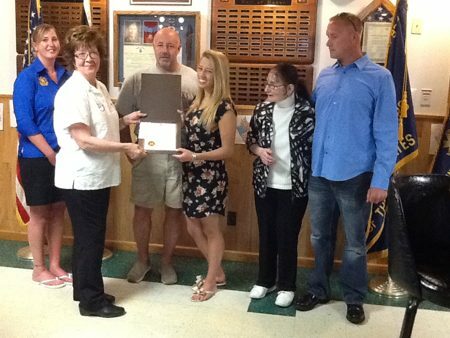 The VFW Ladies Auxiliary recently presented awards to two young ladies from Grand Island. 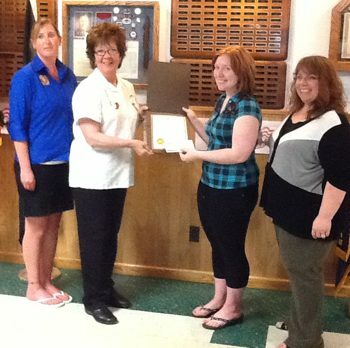 The Lianne Dahlberg Memorial Ladies Auxiliary VFW 9249 Scholarship is in memory of a departed sister who sent 496 Care Packages to our troops in harms way during her 9 year stint. The $500 scholarship, based on an essay on Patriotism, was won by Kristy Kalman. The Ladies Auxiliary sponsored Young American Creative Patriotic Art Contest was won by Ashley Fisher with a prize of $100. In addition, Ashley won the Erie County judging for an additional $50. Nice job ladies! Islanders: Quartermaster Richard Lozo, second from left and Commander Dan McMahon, center. 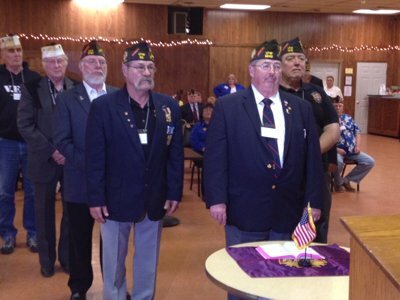 The 70th Annual Convention of District 6, Department of New York, Veterans of Foreign Wars was held at the John F. Ahrens VFW Post 5296 in Salamanca, NY. Award ceremonies included a presentation to the Patriot's Pen Winner, Andrew Thompson of Grand Island, NY. During the business meeting, elections of officers for the 2014 - 2015 year were held, among the officers elected were Commander Dan McMahon and Quartermaster Richard Lozo, Sr. 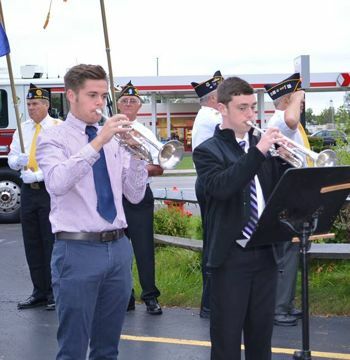 Both are members of the Charles N. DeGlopper Memorial VFW Post 9249, in Grand Island. Commander McMahon and Quartermaster Lozo along with the other officers will lead the nearly 8,000 members for the year beginning in June. Goals are to increase membership and continue to assist Veterans obtaining services and benefits they need. 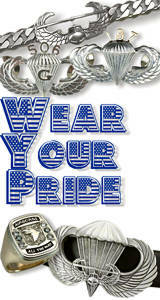 Membership applications may be obtained at any VFW Post. The VFW Post #9249, 2121 Grand Island Blvd. is hosting the last of the 3rd Annual Chicken Dinner on Wednesday, June 4th from 4:00 - 7:00 p.m. Take-Out or Dine under the Pavilion. Pre-sale tickets available and encouraged, stop in or call 773-6343. Dinner price is $9.00 and includes; Chicken, Salad, Potato Salad, Dinner Roll and butter. The VFW is in desperate need of help to man the Buddy Poppy stations Thursday, Friday and Saturday, May 22-24th. 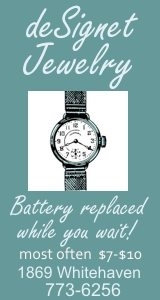 The stations are open from 8:00 a.m. - 6:00 p.m., and even a one hour time slot would help. All ladies and mens auxiliary members and friends and family are invited. Call the VFW Post at 773-6343, let them know when you are available and help the Veterans! The VFW Post #9249, 2121 Grand Island Blvd. is hosting the 3rd Annual Chicken Dinner on Wednesdays, May 7th, May 21st and June 4th from 4:00 - 7:00 p.m. Take-Out or Dine under the Pavilion. Pre-sale tickets available and encouraged, stop in or call 773-6343. Dinner price is $9.00 and includes; Chicken, Salad, Potato Salad, Dinner Roll and butter. The first Men's Auxiliary of VFW Post 9249 Lenten Fish Dinner is Friday, March 21st from 5:00 p.m. - 8:00 p.m. at the Post, 2121 Grand Island Blvd. It includes Baked or Fried Fish, French fries, cole slaw, macaroni salad, bread and coffee. Desserts are available to purchase. Tickets are $10 per person, eat in or take-out. $5 chicken tenders (kids 12 and under). There will be 50-50's and raffles. See flyer for details. There are two other dinners planned for April 4th, 5pm - 8pm or until sold out and April 18th, 4pm - 7pm or until sold out. The Ladies Auxiliary of VFW Post 9249 are hosting their annual Spaghetti Dinner Fundraiser on Saturday, February 22nd from 4:00 p.m. - 7:00 p.m. (or sold out). The proceeds of this event will benefit Cancer Aid & Research Program of the Ladies Auxiliary to the VFW and is in memory of Donna Briggs. Tickets are $7.00 and include all you can eat spaghetti, one meatball, bread, salad, coffee and one dessert. Early Bird is between 4:00 p.m.- 5:00 p.m. and tickets are $6.00. There will be a 50/50 and raffles. 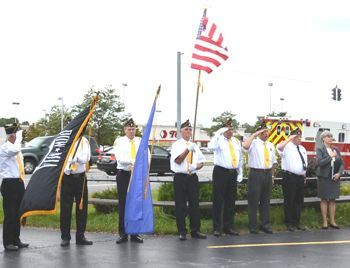 The VFW is located at 2121 Grand Island Blvd. For more information call 773-6343. The Charles N. DeGlopper Memorial VFW Ladies Auxiliary's 10th Annual Soup Night will be Saturday, January 18, 2014 from 4:00 p.m. - 7:00 p.m. or until sold out. The cost is $7.00 for all you can eat soup, salad, bread and one dessert. There are many soups to choose from, 50/50's and a lottery tree. Public welcome!.